Your haters swear that we’ve been fed a diet of lemon for so long that we can’t see reality even if it dressed in babbar riga and landed in a helipad in Daura. At the risk of ending up like Deji Adeyanju and your army of vociferous critics; it is said that your deputy, did not see you in London. After he arrived and discovered the truth, he was threatened to return home, act well any part in this conspiracy to defraud an entire 200 million people or have his secrets exposed. Who could endure the exposure of their secrets even if they have been redeemed? Or didn’t the scriptures say that there is none that doeth good? Stories like this; oh Jubrin of Sudan is necessary cushion against the harshness of lack of economic direction. We all feed on comedy, especially the unbelievable comedy of errors. In Naija poverty has been eradicated under your regime, as any TraderMoni recipient would testify. Doubting Bimpe, Okonkwo and Balas swear that if you had been around, there would have been no massacre at Metele and that the mini-conference on Boko Haram would have been held in Abuja and not N’Djamena. What about that picture in France where Jubrin was looking ahead while other heads of governments were looking at the stars on the ceiling? 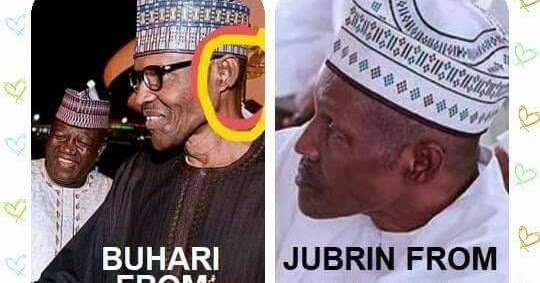 That too is proof that Jubrin couldn’t hear what the French translator was saying! Those who know have asked us to question your speedy recover, apologies to Shina Peters. Some of us have asked the oracle what it would take to debunk this tale. Its response is that you should address the nation in – wait for it- Fulfulde? After all, weren’t you the grand patron of herdsmen? The oracle promises to return grey matter back into the heads of those whose skulls are now filled with fura da nono if you were to remove your head covering in public. If you would wear that tuxedo and bow tie famously used during your 2015 campaign for an open photo shoot at Wuse or Onitsha market, sense would return to the land and people would campaign on issues of national development and cohesion instead of asinine tales. The Oracle was not totally sure how the third condition might change the minds of those who should be having a brain transplant. It says the rumours would go away if you would take a DNA test, not to proof the paternity of Yusufu but to publicly show that indeed you are you and not a body double from Darfur. One thing is likely to chase off these flies from you. Could you drop your 2019 re-election ambition; pack out of the Rock and publicly put Jubrin on a presidential jet to Sudan while you travel by trailer to Kaduna or Daura? The Oracle swears that Jubrin would not survive a day after arrival because Omar al Bashir is not known to brook opposition. With the number of dollars Jubrin was hired coupled with his taste of presidential opulence, it’ll be insane for him not to compete with Bashir. Don’t ask me if I believe this bunkum. Of course, I do. It is insane to be sane in the congregation of the barmy. Even people with verified WAEC results believe it, why should I be different? After all, if you are the same person sworn to bring change at Evil Square why is change missing? Anyway, sleep well tonight. You would not be the first one to have a doubtful personality rumour in office. Remember how they alleged that the Wizard of Ota was born to an Onitsha man in the city under the rock and that a certain loquacious female presidential aspirant was his unclaimed daughter due to a forced resemblance? Stories like this help nut heads sleep in peace. But in case you want external consolation, the nationality of Barack Hussein Obama was an issue by one real Donald who created a birther movement on this theory. He challenged Obama to publicly display his birth certificate. He also swears by what he smokes between the putting green, that Obama is a Muslim whose agenda was to convert the whole America as Dauda Jawara did in the Gambia. Dear Jubrin of Sudan, this is 2018 and these are the issues we talk about between beer bottles and why beer sales have soared. Not being Jubrin of Sudan would have cured diseases, built schools, equipped hospitals, tarred roads and made Naija a better state. Can you make it happen in your second term now that America knows you will wing it?